Click on images to enlarge testimonials. The family and I just wanted to pass on our absolute appreciation for yesterday and for everything you have done for us over the past week. I don’t think you could have made it any easier or supported us anymore than you did. We felt like a weight had been lifted off our shoulders from the moment we spoke with Jim last Monday morning, and every step in between has been smooth and easy. Your service was compassionate and we really felt like you became apart of our family through everything. We cannot thank you enough. The family and I would like to thank you once again for the compassionate and dignified service you provided yesterday for dad’s funeral. Your professionalism and personal touches to the day were more than we could have hoped for. 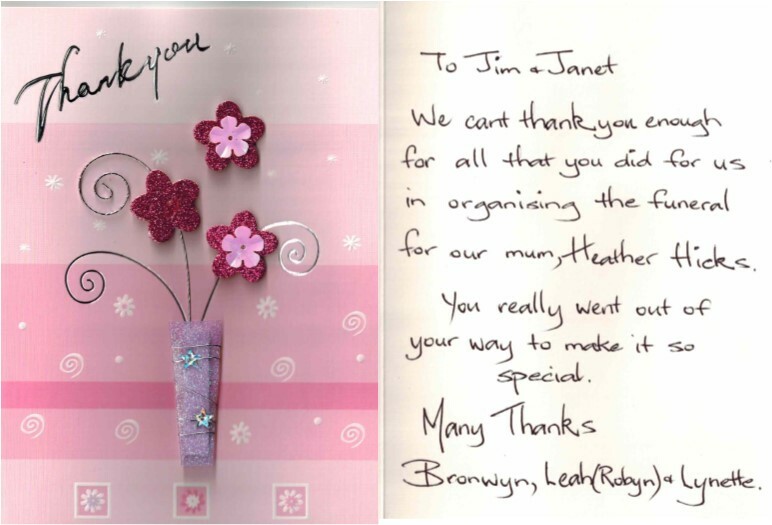 Jim and Janet were extremely helpful throughout the whole process. Their professionalism and understanding of our religion and culture was amazing and we couldn’t have asked for a better service. Thank you both for your compassion, and your help, support and understanding through such a difficult time. The service was beautiful and we have achieved closure because of how smooth everything was before, during and after the process. Even though we’ve lost a loved one, we have gained great friends through Jim and Janet. All our love, Max and Vanessa. Jim and Janet are two of the most helpful, personable yet professional people I have had the pleasure of meeting. They made the whole process of organising my mother’s service as well as all the incidentals from flowers to recommending a wonderful Celebrant and submitting all the necessary paperwork as stress free and quick as possible. Always only a phone call away and answering all my questions without any hesitations. I cannot recommend Nepean Valley Funeral Service highly enough to anyone who needs an easy to deal with, family oriented company to look after you at one of the most difficult times in anyone’s life. Thank you so much, Jim and Janet for everything regarding the passing of our Dad, Gordon. Having to travel interstate to arrange his funeral you were a blessing sent to us. From the first phone call to the end with his ashes to be sent overseas nothing was left to chance. You’re organising skills and attention to detail was incredible. With all his wishes treated with respect your local knowledge was full of insight and respect not only to my Husband and me but reaching out to all our extended family and friends. With the feeling of security all was safely in your hands with ongoing support through out. Giving us the chance as a family to grieve, that meant a lot to our family. I hope you realise what an exceptional service you give in such a sad time in our lives. Jim and Janet you are amazing and so caring. Once gain thank you so much. On behalf of the whole family I would like to pass on our sincere thanks to you, Janet and all your staff for the excellent service we received during the recent passing of our father, grandfather and great grandfather, John. From our initial phone conversation I knew that we were in good hands. Your ability to help get everything organised from the flowers, mass booklet and music made my job so much easier. This type of help is invaluable when you are going through the grieving process. The support you and your staff provided to our various family members on the day of the funeral to ensure that all aspects of the service went according to plan and was conducted with dignity and respect for dad, is truly appreciated. I am so glad I chose Nepean Valley Funerals as I know dad would have been pleased with his send off and agreed with my choice. So once again Jim, please accept my sincere thanks for all that you have done and please pass this on to all your staff. Feel free to use this email in your testimonial page so others can hear about the exceptional role you play at a difficult time. Just wanted to sincerely thank you for doing Dad’s funeral yesterday. 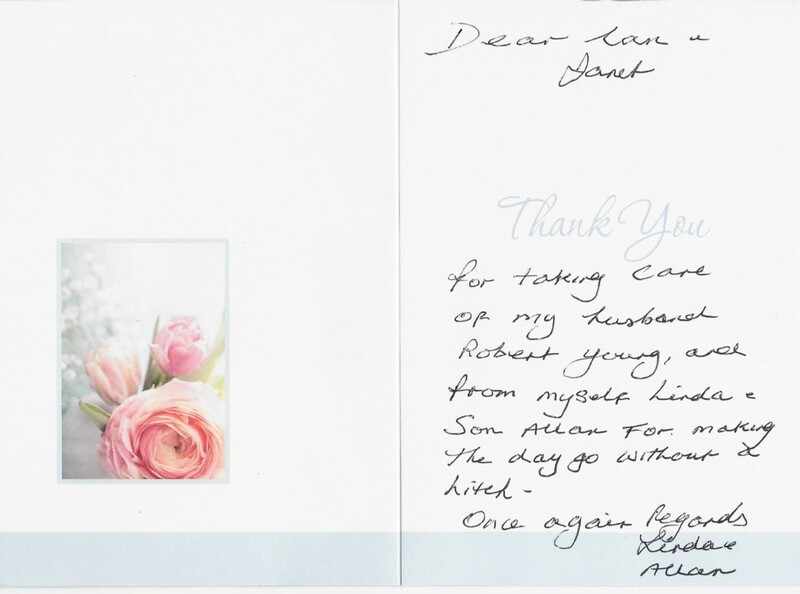 Everything went off smoothly and your caring compassionate help at a very difficult time was so appreciated. Thanks for organising everything behind the scenes so everything was calm and peaceful just the way we wanted it. Your attention to detail was great in attending to our requests. You helped make the day a wonderful celebration of Dad’s life. We also value the way you communicated so well with us during the whole process keeping us well informed and making caring for Dad your highest priority with such a lovely caring attitude. I just wanted to thank you both on behalf of my brother, Mark and sister, Leah, for arranging our dad’s, Dieter’s, funeral. We are very grateful for your professional and light hearted guidance with this as we were all unfamiliar with how to make the arrangements. From the moment we met you, we knew we had called the right person. You helped with everything from the hospital to the chapel and made a perfect suggestion about the celebrant, David. Thank you so much Janet and Jim for organising the funeral today for… my Dad’s passing. Your compassion and professionalism made the day so special for us. You both did all the hard work and we attended today without a worry in the world as you had it all sorted. Your suppliers, singer, organist, stationery provider are fantastic and they were so professional and lovely to deal with. You let us focus on what was important today and that was my Dad. Words can’t express the gratitude we feel for everything you have done. Thank you just isn’t enough. Love from Rita and the family xxxx. I just wanted to thank you so much for all of your support and assistance. I really don’t think I could of done it without your guidance.